Hello, everyone!! 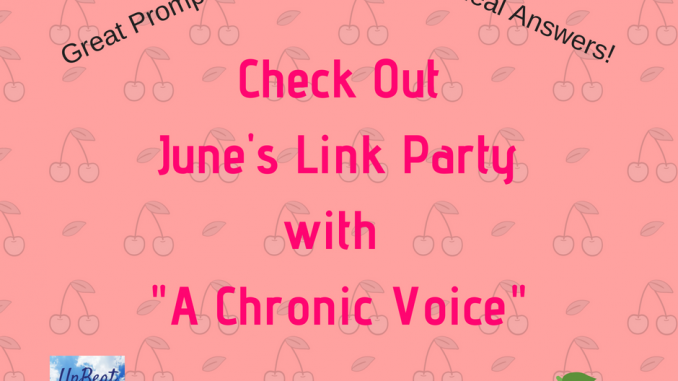 It’s time for June’s Link Party with Sheryl at A Chronic Voice. Sheryl’s prompts always seem to speak to my life, and this month’s prompts are no exception. Yet again my body is reminding me that I’m awful at pacing myself. This spring has been really, really stressful. I’ve moved into an apartment; put my home up for sale; watched my “baby” graduate from high school; and worried and fretted over another child’s health, and the health of my aging father. I feel more than a bit untethered and adrift. I’m not sleeping well. Physically and mentally, I’M EXHAUSTED. Since pacing is vital to us spoonies, I’m trying to pace my activities, but I’m struggling. I start an activity thinking I’ll enjoy it, only to find myself wondering why I thought I had the energy for it in the first place. My brain feels like mush when I sit down to write. I have loads of ideas until I’m in front of the blank page and my mind goes as blank as the screen. Not a good thing for a blogger. Pacing has been and continues to be the hardest thing for me to do on a daily basis. I think this is so, because I almost always under-estimate how much energy a task will take. Or maybe I over-estimate my energy level. Either way crashes and flares are a weekly occurrence lately. Ugh! 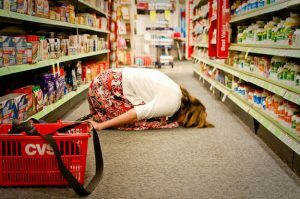 Maybe it happens so much because of the extra stuff that comes our way; the unexpected that pushes us over the edge. The sudden illness of a parent or chronic-illness-diagnosis of a child. The expense you didn’t plan for. Or the slip and fall that is making that arthritic knee way more painful than usual. Whatever it is, I find pacing to be a daily challenge. What about you? Lately, I’ve been fighting against the inevitability that teens grow up, and leave the nest. My youngest son has left my nest, and I want to hold on to him for just a while longer. I want to keep him near me for now. Really, I don’t want to let go. But all I can do is watch him soar away. He doesn’t realize that he’s taking a chunk of my heart with him. I don’t want to surrender to this. Nope, not at all. Next, I’m on a journey to keep improving my writing and my blog. I’d like to write a book one day. I’m also improving my art skills. I’m participating in this year’s index-card-a-day creativity challenge. I just don’t have the energy to do a card everyday, but since June 1st, I’ve created 6 cards. You can see some of them on my new Instagram page. 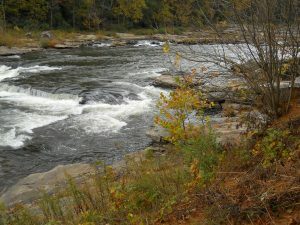 Oh to be like water in a stream, and just flow gracefully past and around every bump and obstacle. Julie Holliday, calls it “relaxed effortlessness.” I think it’s time for me to revisit her course materials. You can read more about her course here. Your prompts are always spot on, Sheryl. Thank you once again for hosting this link party. 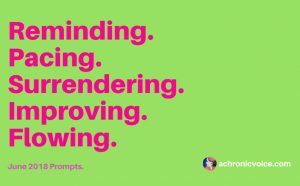 Finally, I would love to read all of your thoughts on these prompts in either the comments below or in your linked post. Join the discussion. Your story matters, too!! If you would like weekly email updates on new posts and subscriber-only extras in your inbox, please sign up below. Is the Oska Pulse Pain Relief Device Worth Trying? “Pacing has been and continues to be the hardest thing for me to do on a daily basis.” I can really relate to that. Seems like so many spoonies struggle so much with pacing. sigh. And hear you, surrendering. Hope you’re managing okay! Thank you very much for reading and commenting. I loved reading your answers as well. And your photos were awesome. I’m glad I could be of help. I can’t wait to go and read your post. The time really does go by so fast. Thanks so much for reading and commenting. Personally, I think taking good photos is an art. I’m not sure of any art challenges for photography or computer art, but don’t let that stop you from creating. If you can create computer art that’s awesome. I’m technically challenged. LOL! I participate in the icad challenge as I’m able. Keep it fun and for you and whatever creative projects you do will do good for your health and spirit. Thank you for always taking some time to reflect and participate Kathy, no matter how busy you are! And I think the prompts are ‘spot on’ more because as spoonies our lives run in parallels, no matter where we are 🙂 I hope to be given the ‘opportunity’ to get that empty nest feeling one day, to be able to love that much 🙂 For now, please tune all activities down a notch and have some relaxation time for yourself! Dear Sheryl, I’m always happy to read your thoughts. I hope one day that you also get the privilege of raising a child. I cannot imagine what it must be like to have health issues at such a young age, and to wonder if you’ll ever be able to experience what most of your peers are experiencing. Sending love and gentle hugs your way, friend. Have saved this to savour and read for later tonight, but just wanted to let you know that I added this to the main linkup page so others can find and read it, too! Hope that’s okay!